Last weekend, I decided to watch Ratatouille. After watching Ratatouille, I then made the decision to watch Bee Movie, which isn’t exactly the best thing to do. In honor of this viewing, I’ve put together a comparison to aid in anyone’s decision as to what film with a creature frequently viewed as a pest that was released in 2007. –Ratatouille is about a rat named Remy (Patton Oswalt) who dreams of being a chef and ends up helping a hapless garbage boy, Linguini (Lou Romano), in order to achieve this dream. 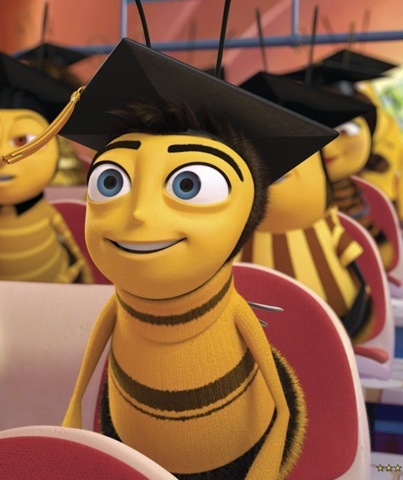 –Bee Movie is about a bee, Barry B. Benson (Jerry Seinfeld), who leaves the hive, falls in love with a woman and finds out the human race has been stealing honey from people. He decides to sue the humans and fucks up the eco system. –Ratatouille is made by Pixar and manages to look realistic and cartoonish. –Bee Movie is not made by Pixar and looks like a cartoon. –Ratatouille not only features the voice talents of Oswalt and Romano, but also Brian Dennehy, Peter O’Toole, John Ratzenberger, Ian Holm, Brad Garret, and Janeane Garofalo. Each of these voiceovers feels more like acting; never once did it feel like an actor voicing themselves. –Bee Movie features the voices of Seinfeld, Matthew Broderick, Renée Zellweger, Kathy Bates, John Goodman, Chris Rock, Megan Mullally, and Patrick Warburton. Except for Zellweger, it feels like the actors are just doing what they usually do. I seriously kept expecting Warburton’s character to pull out a knife and kill someone at various points of the movie. Which would have made the movie a lot more interesting, but really shows just how much Venture Brothers I’ve watched. 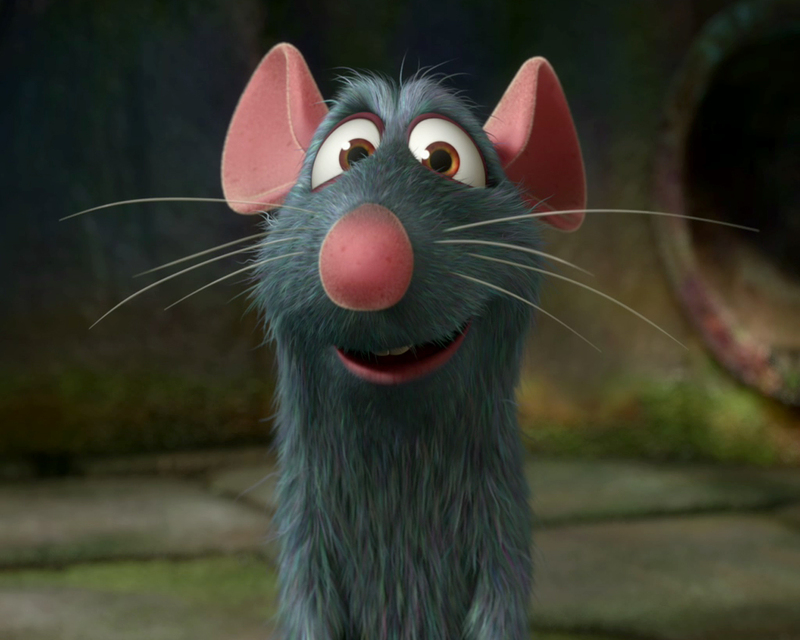 –Ratatouille does not employ pop culture references with its storytelling. –Bee Movie does employ pop culture references when telling a story. That being said, I did laugh very hard at “Bee Larry King.” (Barry: “How old are you?”) And that was about it. –Ratatouille has Peter O’Toole as the venomous food critic Anton Ego, “The Grim Eater.” And every second of the scenes with Ego is an absolute delight to watch and listen to. –Bee Movie doesn’t have Peter O’Toole. Period. –Ratatouille makes me cry every time when we hear Ego’s review of the titular restaurant in the film. –Bee Movie didn’t make me cry. -The crowds of tourists on Michigan Avenue are really annoying. -The Chicago Transit Authority is a valid reason to be late for class. -The musicians at L stations can be pretty good. -Although Argo Tea is a chain, their tea is really, really good. -Tea at Starbucks tastes like crap. -Having to walk from a bus stop or an L stop to your destination is a good way to become oriented with the city. Which comes in handy when people ask you for directions. -People who go to college to party don’t give a damn about what the Olympics would do to affordable housing on the South Side. -And those same people will view you as being unpatriotic for not wanting the Olympics to be in Chicago. -LED ads on the sides of buses are really startling to the eyes at any time of day. Yet the LED sign at ABC 7 on State Street is not that hard on my eyes. -Nothing is open in the Loop for post-theater dining. So, pre-theater dining is a very good idea. 1). The Brown Line is quite possibly the most scenic line of the L. Very lovely. 2). The Fullerton Dominick’s is really messed up. 3). If you call 911 and ask for an ambulance, the fire truck will also come. I’m assuming that this is because the ambulance is part of the fire department. 4). Navy Pier really is an overrated tourist trap that I will only go near for WBEZ or Chicago Shakespeare. I don’t know why I ever doubted anyone. 5). People in Chicago don’t drive like people in Iowa. Actually I already knew that, but it’s still something nice to remember. 6). Unless you really don’t feel like walking the distance to get there, there is no reason to take the Fullerton bus to get to Halsted. Because it takes about one minute to get from the Fullerton and Seminary stop to Halsted. 7). Any object exploding sounds really loud if it explodes near your open window. 8). Construction crews start work really early. Trust me, I learned this the hard way. 9). The Harold Washington Library is absolutely beautiful. They also have a lot of books there, but the architecture is beautiful. 10). On really beautiful days, some businesses/restaurants will open up their windows, which might be windows that fold back or slide back. The breeze you get from this is very nice, but you do have to have something holding down the newspaper so it doesn’t go flying everywhere. Today came two more announcements about the 2009-2010 Broadway season. “Hamlet” with Jude Law (I’ll have more on that later) and “Oleanna” with Bill Pullman and Julia Stiles will be coming to Broadway. While this does mean that I’ll probably have more posts entitled “Dammit, Mamet” in the fall, this also means that the 2009-2010 Broadway season is also starting to become a bit more full. So, with that list, this is how the season on Broadway will look like. On another note, at this moment, they won’t have to nominate every musical revival that opens next season like they’ve had to the past two years. This and blogging about it next week will probably be the extent of me being ebullient for the Tonys. So here they are, presented with who I think will win and who will win in the event of an upset. Special thanks to my father who aided in the predictions for musicals. Hey, it’s an American play. I’m going with those two because they’re the two most critically acclaimed revivals, but I really doubt that “The Norman Conquests” won’t win the Tony. Let’s just say that I’m predicting that if any show upsets “Billy Elliot”, it will be “Next to Normal”. I adore Raul Esparza, but I’m not holding my breath for him to win a Tony this year. But if he does win, you’ll know about it. If the three Billys don’t win, that will be quite the upset. I might be over confident that Alice Ripley will win. Watch me be wrong. I am maybe overly confident that Karen Olivio will win this, but if not, Haydn Gwynne. Statistically, Matthew Warchus has the best chances of winning. What is it with Stephen Daldry and juggernauts? I really doubt that Peter Darling won’t win the Tony Award. Come on, the show is about a boy who want’s to do ballet. What? Did you think I was going to say “Guys and Dolls” for an upset? I just think it’s safe to put “Billy Elliot” in. –In the event of an upset:I have no clue. There is a thunderstorm that happens in “Mary Stuart”. I read Hilton Als review of “Hair”. And every review I’ve read on a blog of “Rock of Ages” has said the show was loud. My father: It’s Liza. ‘Nuff said. Remember to come back here next Sunday when I’ll be live-blogging, or more or less blogging during the commercial breaks. Saturday, my mother and I went and saw X-Men Origins: Wolverine. Throughout the film, the row of people in front of us spent the film texting throughout the entire film. How they managed to do this with Marcus Theatre’s numerous “Turn off your cellphone” reminders pre-film, I don’t know. But for some reason, bad behavior at a film is much less annoying than bad behavior at the theatre. This has recently been discussed by Leonard Jacobs on the Clyde Fitch Report and John Moore of the Denver Post has addressed this issue. I have addressed this before on my blog, and thought I would just compile a list. Remember, I mainly see amateur theater, not Broadway or professional companies, and for some reason, the behavior seems just as bad. I’ve waited until intermission to tell someone who’s with me what I’m thinking. Although my body language tends to convey this very well. Please don’t talk throughout the entire show. When I saw “Bell, Book, and Candle” at the Waterloo Community Playhouse, I was surrounded by people who couldn’t keep quiet and missed several of the actors’ lines. Also, if you’re going to talk, please talk about the show. Chances are, they really want to enjoy the show, not talk about your granddaughter’s piano recital they didn’t go to. This is a good sign that they are a critic. So it’s a good idea to not talk to them during a show. Asking them “Why are you taking notes?” will probably annoy them greatly. Although, I’ve taken to waiting until intermission to answer this question. Yes, everyone says this, but it really is annoying. I believe a cellphone went off during “Rumpelstiltskin” (I’m actually not sure if it was that or “Joseph”. I think it was “Rumpelstiltskin” because the theater was darker) and I just put my head on my hand and thought “Dear God!” Text messaging is very annoying as well. If the show is really that terrible, get up and leave. Trust me, I’ve been to shows where the audience understood this concept. 3). I really can’t sum this one up in a nice tidy sentence. Let’s say you’re at a show because you know a cast member. (Funny story I’ll get to later.) First of all, who they are playing onstage is completely unrelated to who they are. Usually. So, if some guy you go to school with is kissing someone in a play, don’t go “Ewww…”, just sit there. I’ve used this example before, I’ll use it again. A friend of mine played John in a production of David Mamet’s “Oleanna.” To those unfamiliar with the play, he beats the other character at the end of the show. We get along very well and I have no fear of him ever doing this to me. He’s a really nice guy, actually. Second of all, don’t hoot after their scene is over. You can wait until the curtain call. It’s not as bad as automatic standing ovations in my book. Some theaters do not allow children under a certain age to be in their theaters. Other theaters do not have such a policy. (Strangely enough, the Gallagher-Bluedorn does not have a policy.) This is unfortunate because screaming, crying children are really annoying to other audience members. So annoying, I am sometimes amazed that an actor doesn’t break character and the fourth wall to tell an audience member to please take their child out of the theater. Please leave your infants and toddlers–unless you’re a group of preschoolers attending a play with special school performances–at home for the evening. However, due to the current economic situation and the fact that I doubt most babysitters are willing to do pro bono work*, if you must take your child, please take them out of the theater to console them as soon as they become fussy. Candies or throat lozenges being unwrapped during the performance are very annoying (although, I find that Ricola wrappers aren’t very noisy). Throat lozenges I can tolerate more because the sound of a crinkly wrapper is nicer than someone coughing loudly throughout a performance. Most theaters have a no food or beverage policy, but some ushers are not always attentive and people can slip tiny candies in their bags easily. But drinks should be an obvious. I was almost clobbered in the face with a water bottle during “Joseph” because a woman was making very large hand gestures with her water bottle. Just don’t. Unless the actors ask you to join them, don’t. Please. And now for that funny story. When I went to get a ticket for “The Importance of Being Earnest” at the Cedar Falls Community Theatre, the woman at the Box Office asked if I knew anyone in the cast. She said it in a manner that implied that in order to be seeing it, I must know someone in the show. I didn’t know this was a prerequisite to see theater. *I, your humble blogger, do hold a babysitters license. I took a very lengthy class to obtain it when I was in seventh grade. However, I have never babysat because people were content with their usual babysitters and I tend to look very serious and not very fun to be around. I would have been willing to do pro bono babysitting for people, but now I’ve given up on doing so.